Simon Marius (latinized from the German Simon Mayr) was born in Gunzenhausen, Germany on January 10, 1573. His father was the mayor of Gunzenhausen in 1576. From 1586 to 1601 he studied at Markgraftschaft's Lutheran academy in Heilsbronn. 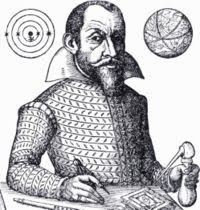 During this time he became interested in astronomy and his observations began in 1594. In 1596 he published an account of the comet of that year and in 1599 he published a set of astronomical tables. On the strength of these publications he was appointed mathematician of the Markgraftschaft of Ansbach. In this capacity he published astronomical predictions each year until his death. Soon upon his appointment he traveled to Prague to study under Tycho Brache, unfortunately Brache died soon after. He then went to Padua to study at the university there. He returned to Ansbach in 1605 and married Felicitas Lauer, the daughter of his publisher. In 1609 he published the first German translation of Euclid's Elements. In 1608 he learned from an artillery officer about spyglasses. Marius attempted to reproduce the device with the officer, but it was not until 1609 that he obtained a telescope that was good enough to be used for astronomical observations. In December, 1609 Marius turned his telescope to Jupiter, where he observed 4 satellites orbiting the large planet. Because he was the first to publish Galileo Galilei is usually given credit for discovering these satellites, but his observation of them is dated January 1610, after that of Marius' claim (which Galileo would dispute). It is Marius who is given the credit for naming these four satellites (Io, Europa, Ganymede, and Callisto) which he named after four human consorts of the Roman god Jupiter. Regardless of who was first to observe them, it was Marius who first published tables of their motions. At the time of their observation the satellites of Jupiter, moons that orbited a planet other than Earth, went against the model of the solar system that was prevalent at the time, the Earth centered model put forth by Aristotle. Because these observations ran counter to that model many believed that they were the result of defects in the telescopes used to observe them. Today we know that Jupiter has 63 moons, the most of any planet in our solar system. Marius also observed the Andromeda nebula, which had been observed by Arab astronomers of the Middle Ages, and he also observed sunspots. His observations of stars led him to believe that they were not as distant as would be required by Copernican model of the universe, where all the planets, including Earth, orbit the sun. Marius believed in the Tychonic system, where the planets orbit the sun but the sun orbits the Earth. We now know that the Copernican model is correct. A crater on the moon is named after Marius. Marius died on December 24, 1624 after a brief illness.